In an effort to stir up more conversation about Leadership and Self-Esteem, the COO of Facebook, Sheryl Sandberg, has launched a “Ban Bossy” campaign. Is it not ironic to anyone that telling others what to do is a perfect example of exactly what she is “attempting” to ban? The conversation to have as leaders is what leadership parity looks like; it is a strength-based dialogue. The campaign would be more effective if it described the results: Voices heard. Sheryl, go back and THANK that teacher for calling you bossy, because now you ARE the boss. Look where your alleged “bossiness” got you…to the C-Suite! She viewed talent in you, to which she chose to attach a negative connotation, due to the existing social construct. Her feedback was a gift. She was a product of that cultural era, AND she recognized that Mindy must a) think for herself, b) have a voice; and c) not be subservient to others! If I had Mindy as my daughter, I would be grateful to that teacher. If I had Sheryl as my daughter, I would be proud to know I have a future leader in my gene pool. Eleanor Roosevelt: “You can often change your circumstances by changing your attitude.” My proposition is to have women EMBRACE the term Bossy. We, as leaders, CHOOSE to apply a POSITIVE connotation to the word, instead of stepping on our own power. Empower yourself from within. Do not surrender your power to the admission that “Sticks and stones hurt our bones, and words are something we can’t get over, no matter at what level of influence we attain.” Slang has changed a lot of words: phat, the bomb, SNAFU. (Perfect web example: http://bossygirl1980.com). “Chicano” used to be a word that had negative connotations, until those who are Mexican-American chose to use it as an identity of pride. Now universities, such as UCLA, boast programs such as the Department of Chicano Studies. Are the dean and chancellor, et al, of UCLA attempting to be rude? Traditional methods of solving problems in human systems are no longer adequate. Appreciative Inquiry is an approach that can be applied to any organizational change process or model. The focus is on WHAT IS DESIRED (i.e. the Pygmalion Effect), versus the negatively reinforcement of what is NOT appreciated. This negative messaging is precisely how young people become horrible supervisors – they do not focus on the constructive guidance; rather, they rant for 30+ minutes about how the employee failed. How does this improve performance? Leaders work on building and infusing energy, not purposely demoralizing resources/talent. Whose interest does that serve? 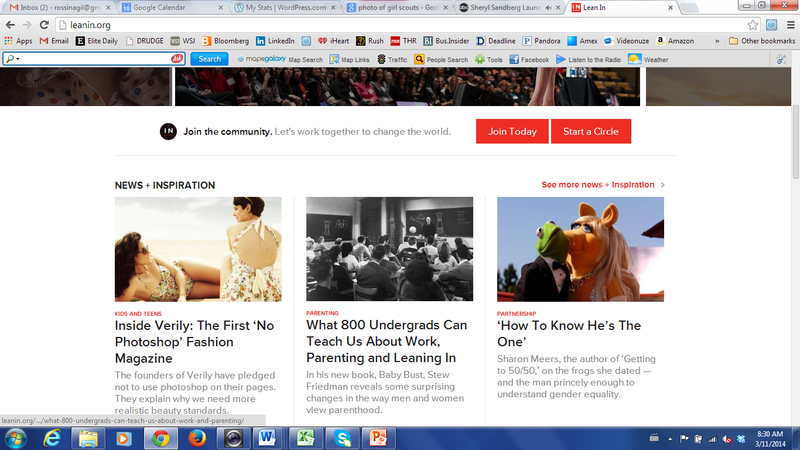 If the intent behind banning the word “bossy” is to raise self-esteem, then why has Miss Piggy been featured on LeanIn.org’s home page for months? 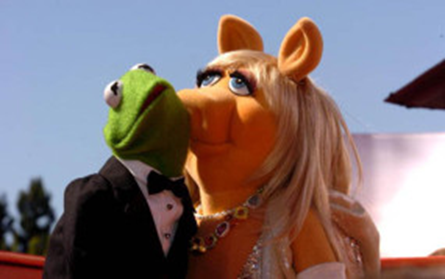 Is Miss Piggy a healthy representative for a culture which suffers from body image issues? (BDD – Body Dysmorphic Disorder). For Lean In’s messaging to proclaim how women/girls need to develop their leadership skills and self-esteem, why does their homepage feature Miss Piggy with the article “How to Know He’s the One”? How EXCLUSIVE is that for those of us who are happily single &/or lesbian? Why is Leadership & Management relegated for us to scroll down BENEATH the screachingly 1950’s stereotype of “Kids and Teens, Parenting, and Partnership”? (This alone makes me scream to Hera to help us). What is being subliminally reinforced here as a priority for us women? The new wave of feminism is called EGALITARIANISM. “Masculinist” does not exist as the antonym to “feminist.” We leaders CHOOSE to use words that UNITE; not divide. Thus, we are Egalitarians. We ask for Equal Pay for Equal Work and Equal Treatment. No more of this women earning 77 cents on the dollar nonsense. What the heck does “feminine anything” have to do with that? This type of Ban Bossy conversation is unequivocally NOT the one to have to advance women and girls. It is a detrimental and divisive conversation that takes us two steps back, instead of a quantum leap forward. The intent is well-meaning; the impact is harmful. The adverse, unintended ramifications, for our blossoming girls is that our nation’s most powerful, fierce (dare I say, BossY?) women are telling them to not be bossy. Ignore the weeds. Bloom, baby, bloom. Rossina Gil, MSOD, MAIS, is a Leadership and Organization Development Practitioner who focuses on positive growth (see logo); not on the weeds. She is the Chair of Nashville’s Mentorship Programs. CorporateLookingGlass.com. Posted on March 11, 2014, in Uncategorized and tagged Antoine de Saint-Exupéry, Appreciative Inquiry, Ban Bossy, BossY, Facebook, Lean In, LeanIn.org, Mayor A.C. Wharton, Miss Piggy, new wave of feminism, Pygmalion Effect, Sheryl Sandberg, Vanderbilt University Healthcare Workforce Diversity Forum. Bookmark the permalink. 1 Comment. Great perspective. Never one for banning anything but all for positive messaging to youth — both boys and girls — bossy or otherwise. Being called bossy worked out pretty well for Tina Fey.